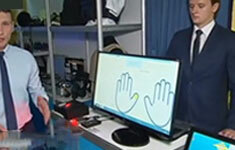 The Russian delegation showed off the federal AFIS at the ‘Special Equipment and Communication’ exhibition. AFIS database size was more than 90 million tenprints. The federal nationwide AFIS based on Sonda’s technology is capable to perform fast and accurate identification anywhere and anytime right in the field. The rapid mobile identification system processed queries to the remote biometric server with blazing speed and accuracy. The identification time ranged withing 3-4 seconds via smart-phone or tablet with in-built fingerprint scanners. Police patrols armed with this equipment could check offenders or suspicious persons both on internal databases and international ‘Black lists’ of Interpol. This is especially important on public mass gatherings: World Championships, Olympic Games, festivals, meetings. The rapid mobile identification found to be very effective to be a core of a common information database for all CIS countries. According to Vladimir Kolokoltsev, the Minister of internal Affairs of Russia, it could be so handy to combine the efforts of the ministries in the fight against terrorism, organized crime and illicit drug trafficking.